Laying a new lawn is an exciting time for any landscape project or garden installation. However, it is paramount that the right environment is created for it to thrive. To ensure the successful establishment of any new turf it is essential to prepare the soil bed thoroughly and lay the turf correctly. To help with this we have collated answers to the most commonly asked questions from preparing the soil bed, through to laying and establishment. How do I prepare a new soil bed? Thorough preparation of the soil bed is very important for the successful establishment of your turf. A minimum depth of 150mm (6") of a good quality free draining topsoil is recommended to lay your turf on. The soil should be spread to a uniform even depth and firmed up by "heeling in". It is always worthwhile investing additional time firming the soil as this will help to prevent any problems with soil settlement and sinking in the future. This is particularly important when installing turf next to pathways or other hard surfaces. The depth of soil can be checked by using a probe or by installing pegs in the ground to the required depth. Once the levels are correct and the bed has been firmed, apply a balanced pre-turf fertiliser following the manufacturers recommendations and finish off by gently raking the surface to a fine tilth ready for laying your turf. How do I replace an existing lawn? If you are replacing an existing lawn, you will first need to kill off any vegetation using Glyphosate (Round Up). This herbicide will kill the plant down to the root and prevent any re-emergence that may contaminate your newly laid lawn. Please read the product label prior to the use of any pesticide and dispose of all empty packaging responsibly. Once the foliage has died back it will need to be removed. The most effective way to do this is by utilising a turf cutter to strip the surface to the required depth prior to lifting and removal. These are available to hire from most reputable hire shops or garden centres. If you have room, and to be environmentally sensitive, stack the old turf and eventually you'll have some nice compost to use on your borders and other areas of your garden. Following the removal of the old turf, lightly rotovate the area and remove any stones or leftover foliage. The soil should then be raked and firmed up by "heeling in". It is worthwhile to invest extra time firming the soil as this will help to prevent any problems with soil settlement in the future. This is particularly important when installing next to pathways or other hard surfaces. Once the levels are correct and the bed has been firmed, apply a balanced pre-turf fertiliser following the manufacturers recommendations and finish off by gently raking the surface to a fine tilth ready for laying your turf. How do I order my turf? Once you have selected the most suitable turf product to match your needs, please contact a member of our sales team for a formal quotation or to place your order. Our turf is available to order all year round, except during adverse weather conditions, and once ordered it should in most cases arrive on your site by 10am the day following harvest. Please note that all products will be subject to availability at the time of ordering. Please do not order your turf until ground preparation is complete. With the exception of big roll turf, your turf will be delivered in 1m² rolls (1.62m x 0.62m), each roll weighing approximately 25kg. The turf will usually arrive on pallets of 70 or 40 rolls depending on the method of delivery. We strongly advise that you organise sufficient labour to lay the turf immediately following delivery. When ordering, please make our sales team aware of any potential delivery challenges e.g limited access or poor ground conditions, so we can advise a suitable delivery and offload method. If your new lawn has formal straight edges, begin by laying the first row of turf along one side making sure the ends of the turf are tightly butted together. On subsequent rows you should lay the turf in a "brickwork" formation, although this is not absolutely essential. Ideally, you should utilise laying boards when installing your turf. This will not only negate any unnecessary footprinting when transporting and laying, but will also act as a press to ensure good turf to soil contact. If your lawn has an informal shape, you should begin by laying the perimeter turf to form the desired shape and then infill using the same methods as highlighted above. Please bear in mind that wastage due to cutting and shaping is likely to be significantly higher for informally shaped lawns, so you may wish to consider this when deciding on your final order quantity. Always be sure to have your laying and cutting tools ready and lay as soon as possible after delivery to reduce the risk of the turf deteriorating. This is particularly important during the hotter Summer months. If you are unable to complete the installation on the day of delivery, you should roll the turf out over a flat area and water as necessary. The time of year you install your lawn will dictate whether or not it will require additional water input. If turf is laid during the damper cooler months, then it may not be necessary to apply water at all. However you should still monitor its establishment. 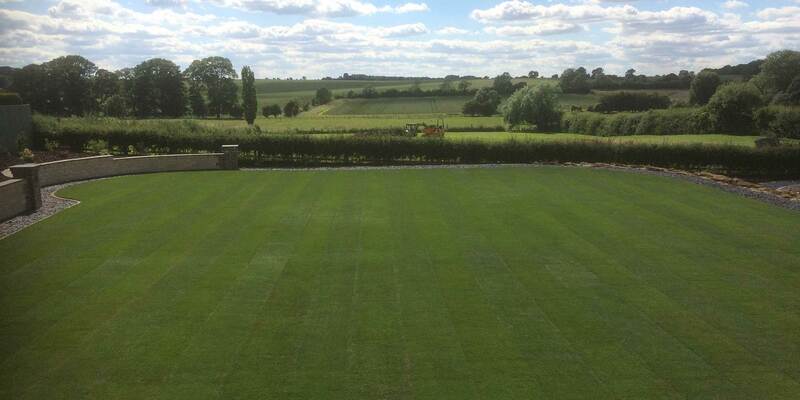 If you are planning to install your turf during the warmer months then it is essential you have water resources available and ready to use prior to placing your order. The first 2-3 weeks are key to the successful establishment of any new lawn installation and particularly during drier periods of weather it is critical that the turf is kept moist and not allowed to dry out and shrink. If you are planning a holiday or you are likely to be away for a few days it is important that you organise somebody to water for you. You should continue to water responsibly until the lawn is well established and the roots are firmly anchored into the soil. You can check this by simply lifting a corner of turf to check on how deep the roots are forming. Once established you should regularly check for any dry spots and water accordingly. It is generally better to water on a little and often basis, however you should adjust inputs accordingly. When can I cut my new lawn for the first time? If your lawn is laid during the Winter months, you may not need to make a first cut until the following Spring. If turf is laid during the growing season, establishment is likely to be much quicker. It is important the grass does not get too long before you make the first cut. This should be done as soon as the turf becomes rooted and stable, but only if ground conditions allow. If you are still watering then always mow prior to application. However, the general rule of thumb is "if it needs mowing, mow it!"